TxFSJa » View topic - Cherokee W/T Tire size?? 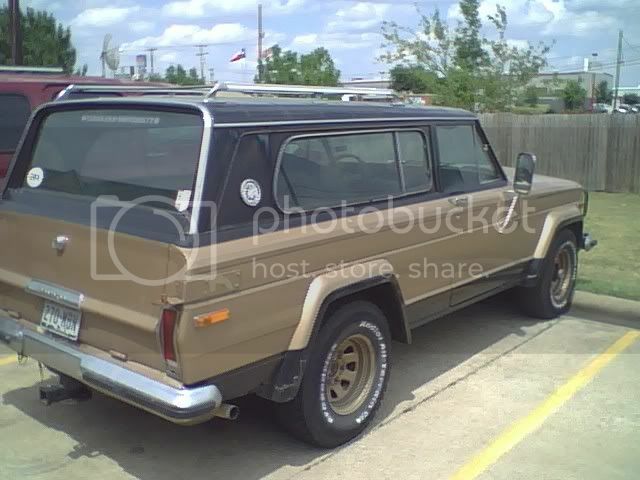 What is the biggest tire I can get on a 79 W/T cherokee with no lift? I am running the white wagons for now. Re: Cherokee W/T Tire size?? You should be able to run a 33" tire without any problems. If you think it's going to be an issue, then put the narrow 33" meats on it. 33x9x15. Wow, the springs under my stock '78 Widetrack must really want to be replaced then ,because the 31x10.50's that are on it barely clear! It should be sitting about 4" to 5" higher than that, just on stock springs. I have 33/12.50/15 on mine with air shocks front and rear for now. I don't have to put much air in them, it's a short cut I know but it works, rides pretty good, and no rub. If I let all the air out, they still clear with no problem. How big can you fit with lift? Say, at 3"? 4"? 6"? The BJs SOA/Reverse Shackel kit is suppose to give you 7inches of lift, and you can fit 36s under it. So that should give you a good idea.